In case you're thinking of getting a Motorola DROID RAZR M from Verizon, now is your chance to act. Right in time for the holidays, the carrier has just slashed the smartphone's price in half – down to a pretty acceptable $50 with a 2-year contract. In case you aren't familiar with the Motorola DROID RAZR M, it's not what one would call a flagship smartphone. Nevertheless, it stands out with being an impressively compact handset despite packing a respectable 4.3-inch display. It is powered by a pretty capable dual-core Snapdragon S4 processor, and the KEVLAR accents on its back add a decent dose of character to the device's appearance. For more information, check out our Motorola DROID RAZR M review. Tempted by the deal? 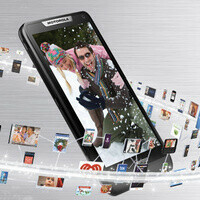 You can go and check out the Motorola DROID RAZR M on Verizon's web page by following the link below. Just keep in mind that the discount is available online only, so don't go looking for it at the carrier's retail stores.